The ideal solution for preparing a delicious rich and delicate froth in an istant. De’Longhi Alicia Latte heats and creates a dense froth in just a few seconds. 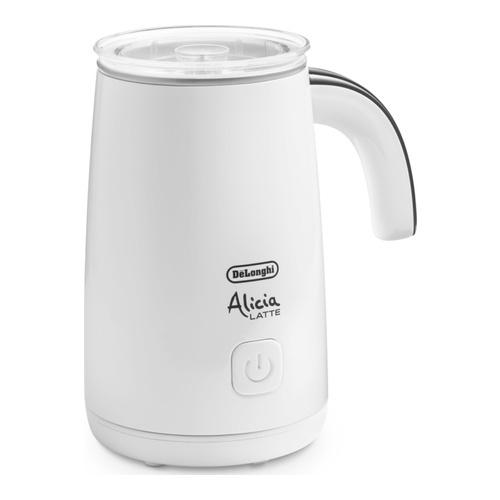 Easy to use, Alicia Latte detaches from the base which makes it easy to pour the frothed milk. A cool touch base in order to put the milk frother in each surface. A red light goes on when you click just once the start button, in order to froth an hot milk. If you push two times the button, you can get only an hot milk. You can also froth your milk manteining it cold, just manteining the button pushing. In this case a blu light will go on. You can also get a delicious iced milk shake, or iced capuccino, just adding some ice before the frothing. A transparent lid in order to monitor each phase of the milk frothing. The ideal solution for preparing a delicious rich and delicate froth in an instant. De’Longhi Alicia Latte heats and creates a dense froth in just a few seconds.